I’ve recently discovered that living in California is like winning the summer fruit lottery — why doesn’t everyone live here? It’s not even June yet, but the peaches! The cherries, the blueberries, the plums, the apricots, the peaches! Ripe and fragrant, everywhere you turn. In May! What is this sort of wizardry? Whatever it is, I’m on board. I mean, Ben and I drove two hours to go peach picking over Memorial Day weekend, and consequently have somewhere upwards of fifteen pounds of quickly ripening peaches sitting in a cardboard box on the kitchen countertop. Thinking about this makes me anxious, so let’s please talk about the apricots, instead. Before the enormous box of peaches, there was a little bowl of fresh and tiny apricots sitting on the counter next to the honey pot. I feel like apricots sometimes get overlooked, as summer fruit goes, but I’m of the opinion that a sweet and juicy apricot could give a ripe peach a run for it’s money, I mean, if there was some sort of contest for these kinds of things. (As far as I know, none such contest exists. Yet.) My affinity for apricots, though, may be helped along by the fact that the sweet little fruits remind me of my (sweet?) little sister, Casey. There she is. 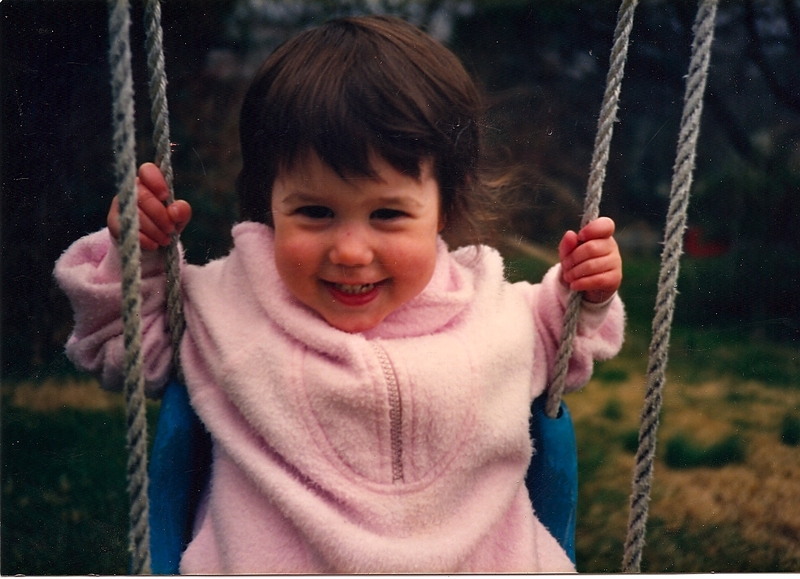 Twenty two years ago, anyway. She’s since grown up into a real person (always the baby of the family, it’s taken me awhile to accept this fact), with a real job and real opinions and a real hairstyle, prone to saying things like “The achievement gap in this country is horrendous” and “Oh, sorry, just working on my classroom seating chart,” and “It’s true, I love a good apricot.” She’s a real class act, Casey is, a first-rate first grade teacher with a smart head on her shoulders and a huge heart, one that breaks over any kind of suffering. She’s the kind of person who tries to rescue the baby bird that’s fallen from its nest in our backyard, the one who organizes book drives at school and befriends homeless people on her morning commute. Casey is as kind as anyone you’ve ever met, though she curses like a sailor, which my parents find hilarious (although they unsuccessfully pretend otherwise). Casey’s sympathetic little heart (fine, her real and grown-up sympathetic heart) makes her feel deeply for the smallest of things, like babies, teacup piglets, and apricots. If it’s small and soft and fuzzy, there’s a good chance Casey will take it under her little adult wing (just look at that pink jacket up there — it’s so fuzzy it’s almost molting). Clearly, Casey doesn’t overlook the apricot. Neither should you, you know. Not when there are galettes to be made. “Galette” might sound like an overly French and intimidating word, but don’t worry, I got you – galette is just a a fancy way to say freeform pie. They’re actually better the more rustic (read: gloriously messy) they look, so let go of your perfect pie crust worries and have a little fun. To make the sweet pastry crust, cream together the powdered sugar and butter until light and fluffy. Add the eggs one at a time, making sure each is completely incorporated before adding the next. Add the cake flour, baking soda and salt at once, and then mix slowly until the dough comes together. Split the dough in half by gathering and pressing the dough into two disks. Wrap each disk in plastic wrap, place one disk in the freezer (for another use) and let the other half chill in the refrigerator until firm (at least 1 hour). Preheat your oven to 350 degrees F, and line a large baking sheet with parchment paper. 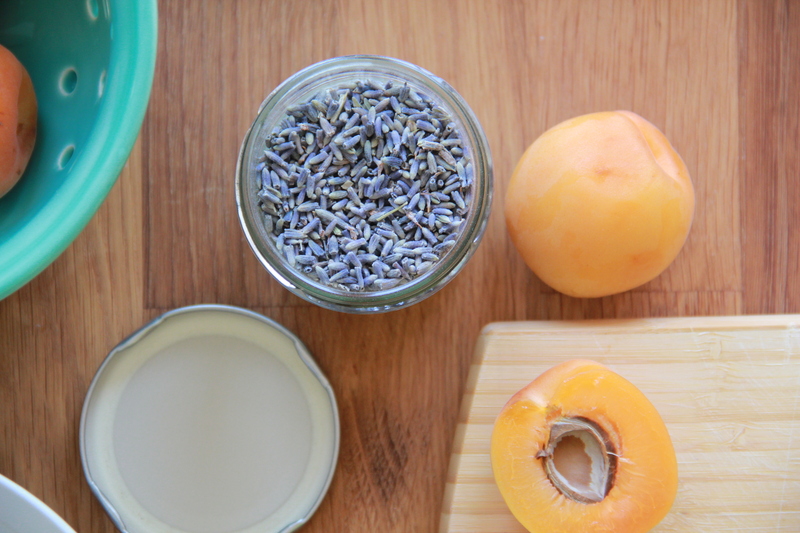 In a small bowl, use your fingers to crush the culinary lavender into the 2 tablespoons sugar. Add the salt and whisk to combine. Once the dough has chilled, remove it from the refrigerator and use a sharp knife to cut the disk in two pieces. On a well-floured surface, roll out each piece of dough into a rough circle about 1/4-inch thick. 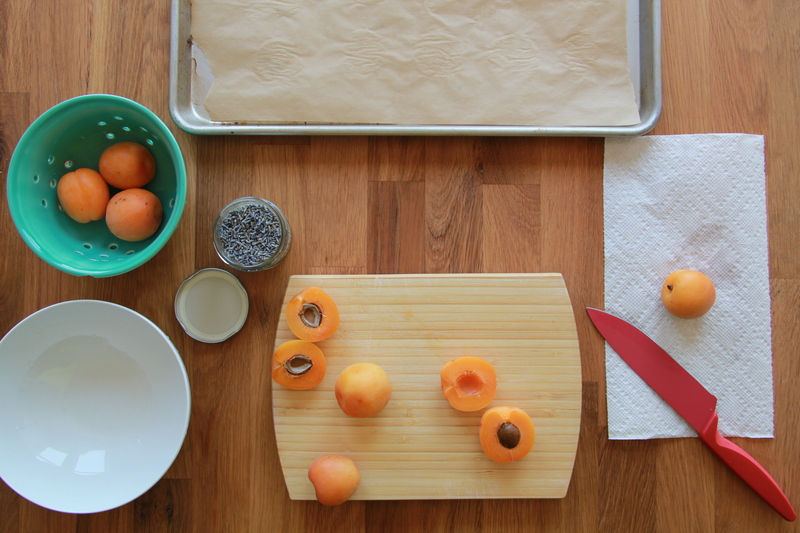 Arrange the apricot halves in the center of each disk, leaving a 1-inch border of dough at the edges, and placing the fruit rather close together. 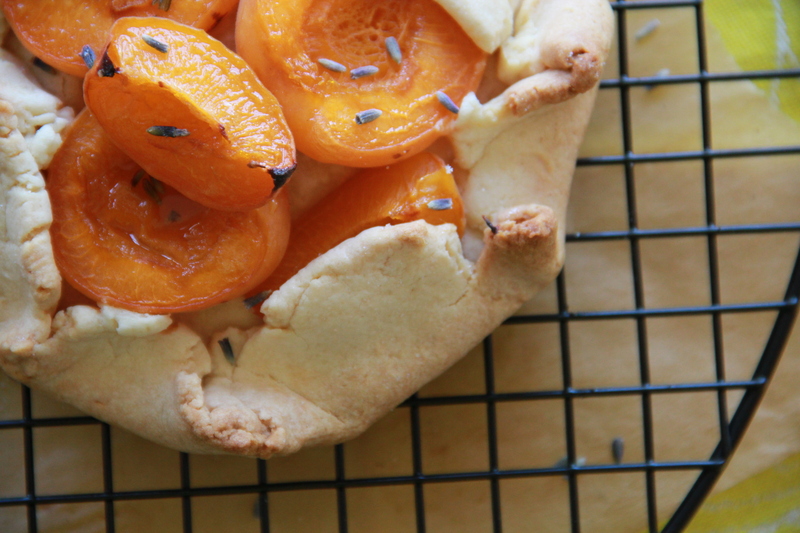 Sprinkle half of the lavender sugar mixture over the fruit on each galette, and then use your fingers to fold the dough edges inward, overlapping each fold until the galettes are nicely formed. 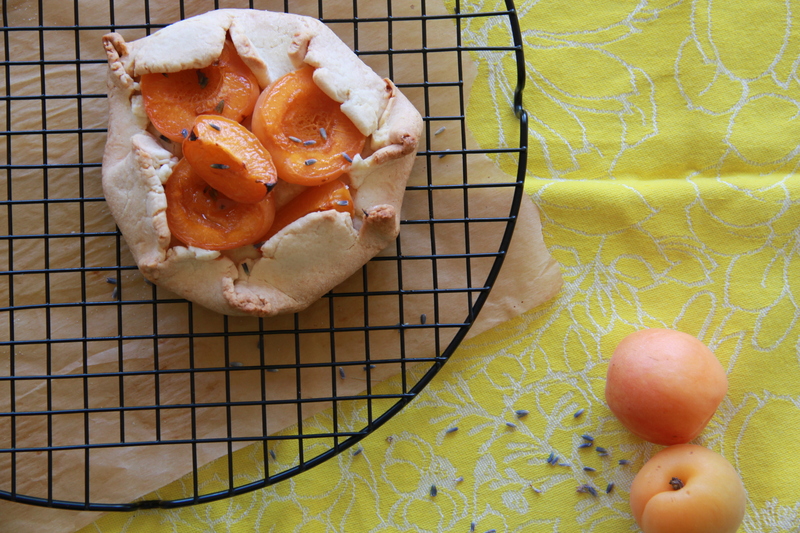 Drizzle one teaspoon of olive oil over each galette, making sure to hit the fruit as well as the crust. Carefully place the galettes on the prepared baking sheet, leaving a bit of space between each. 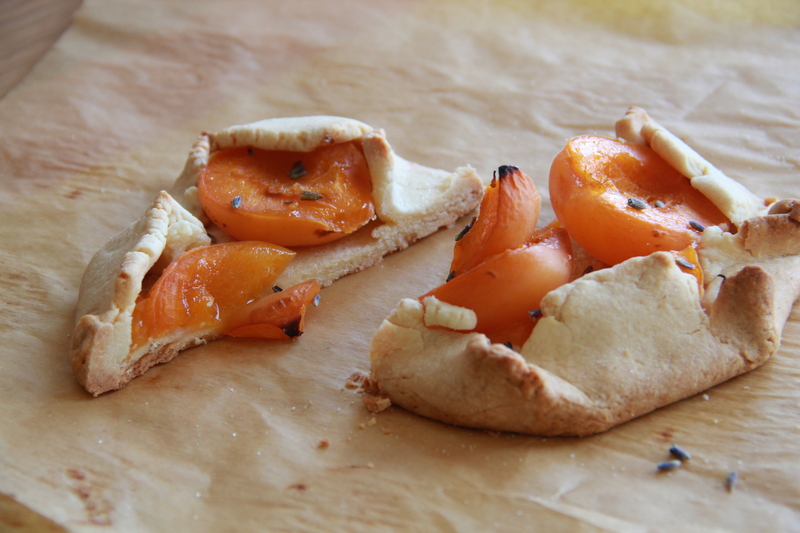 Bake until the fruit have softened and released their juices and the crust is a deep golden brown, about 45 minutes. Cool slightly on a rack before slicing into wedges and eating, alongside a scoop of ice cream or perhaps a cup of tea. The galettes will keep for a day or two in the refrigerator but are best enjoyed on the day they’re made. What a sweet tribute to your sister. Love this entry! That Casey is a good little apricot. Such sweet sentiments about our adorable Casey. They speak volumes about the author as well. Love you both! Wow, this loos so good. Adorable photo!